Raaga.com: Is Vijay starrer PULI financed by the outlaw? Will the movie’s release be affected?? Is Vijay starrer PULI financed by the outlaw? Will the movie’s release be affected?? It is a well known fact that the Indian film industry is backed by usurious funds that are usually financed by the outlaw due to lack of corporate backing in India. However the Income Tax department keeps a ‘Hawk Eye’ on such film producers and try to curb the thriving of outlaw finance in the film industry. Despite the law, it is a tragedy that film producers, particularly the Tamil film producers, continue to rely on illegitimate finance. The latest producers who have become target of the IT department for employing usurious funds for film production are Shibu Thameens and PT Selvakumar, who are suspected by the IT department to have used illegitimate investments for producing their Magnum Opus Tamil movie PULI, touted as the most expensive of movie of Indian Cinema! Alarmed at the irregularities in the funds of the movie the IT department on Wednesday morning conducted raids not only the film producers Shibu Thameens and PT Selvakumar but also raided popular South Superstar’s Vijay’s house, office and other properties. It may be noted Vijay is the hero of PULI that also stars Sridevi. Reports claim houses of other actors like Samantha Ruth Prabhu and Nayantara were raided simultaneously. 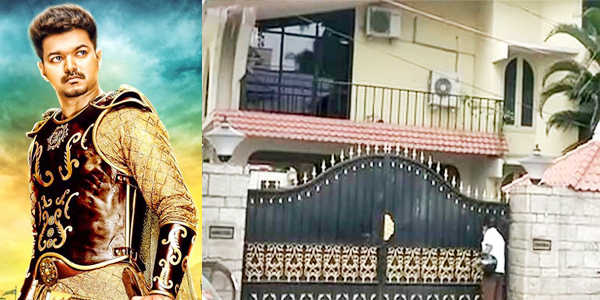 When contacted an income tax official, on condition of anonymity confirmed that the raids were conducted following startling revelations in the accounting of the movie PULI. “Yes it is true that the IT department has conducted raids at as many as 32 places in Tamil Nadu and Kerala. We have detected that a lot of investments in movie Puli are not explained," he confided. The movie PULI is slated to be released on Thursday October 1, hope the raids do not pose problem to the release of the movie as movie buffs are going hysterical to watch the film!